Only a few minutes walk from Aberdeen's Art Gallery, we offer an interesting range of pictures of Aberdeen, Royal Deeside and the North-east, along with a selection of decorative work and hand-made jewellery. We also have a very large selection of picture frame mouldings available and we offer a high quality framing service including gilding and restoration work. Have a look around our website and please do not hesitate to contact us if we can be of any assistance to you. 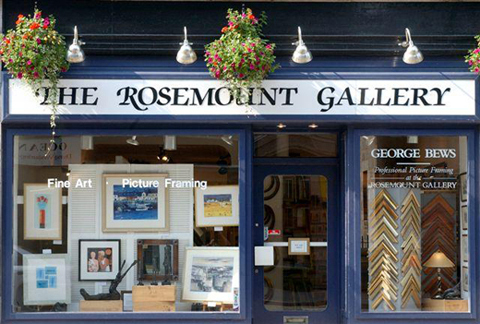 The Rosemount Gallery was established in 1982 by George and Jackie Bews both of whom had considerable previous experience in the fine art and picture framing trade. Jackie Bews worked for a number of years in Taylor's Art Salon in Schoolhill, Aberdeen. George Bews originally trained as a paper technologist, but then also worked with Taylor's where he learnt the craft of picture framing. Jackie is responsible for the Gallery and George manages the workshop facility.